21c: Tell us your proposal story. KB: Mike is from Southampton, and we go out East most weekends in the summer. Before leaving for Southampton, I got a red, white, and blue manicure because I was feeling down about not having my Kentucky girls visiting for my absolute favorite holiday, 4th of July! We arrived at the beach, and I started my normal routine of setting up the umbrella when Mike asked me to stop and let him set it up. I refused, so he grabbed my hand and dropped to one knee. It still hadn’t clicked for me what was about to happen. Then he said, “Actually, I need the other hand.” I started screaming, “No, not now! I have a Dry Bar clip in my hair and no makeup on.” That made everyone on the beach turn around and stare at us. He was cracking up, and yelled to the crowd, “Don’t worry, I am just asking her to marry me.” Mike pulled out the ring box and told me how much he loved me and asked me to marry him. I don’t remember exactly what he said, because I immediately started crying. Mike stood up after he put the ring on my finger and yelled, “She said YES!”. The entire beach started clapping. One of the people from the crowd came over to us pointed at the sky and asked, “Did you pay for that too?. There was a double rainbow in the sky which was so crazy because it hadn’t even rained! I felt like it was my Grandma looking down on us with her blessing. The last time I saw her, I introduced her to Mike during his first visit to Kentucky. It was very special to have her meet him. 21c: What were you looking for in a venue? How did you know you found the one? 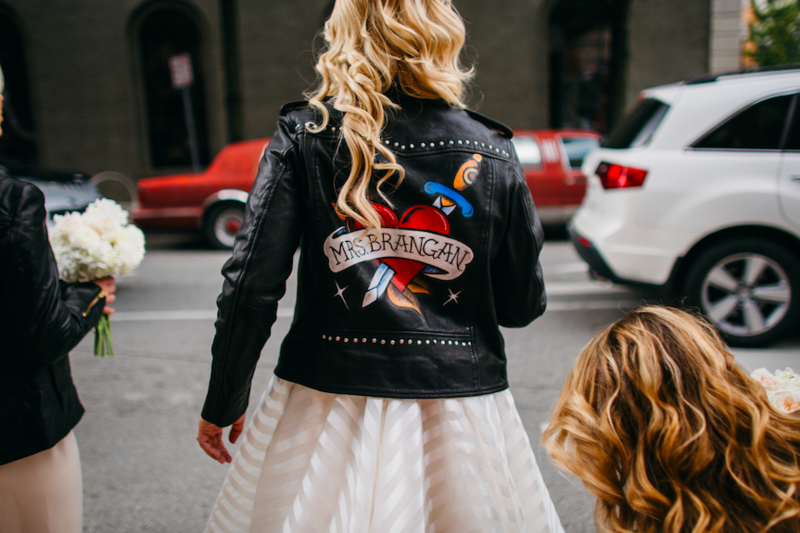 KB: I had always told my best friend, Erin, that I wanted to get ready for my wedding at 21c. After our engagement, I flew to Kentucky to start checking out venues. I fell in love with 21c. 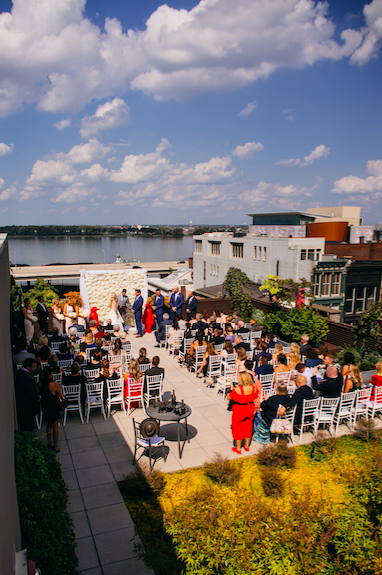 The venue was the perfect way to showcase downtown Louisville. It had both the Southern flair of my hometown and the modern twist that helped incorporate our new home of New York City. Mike and I are members of the Whitney because we love modern art. 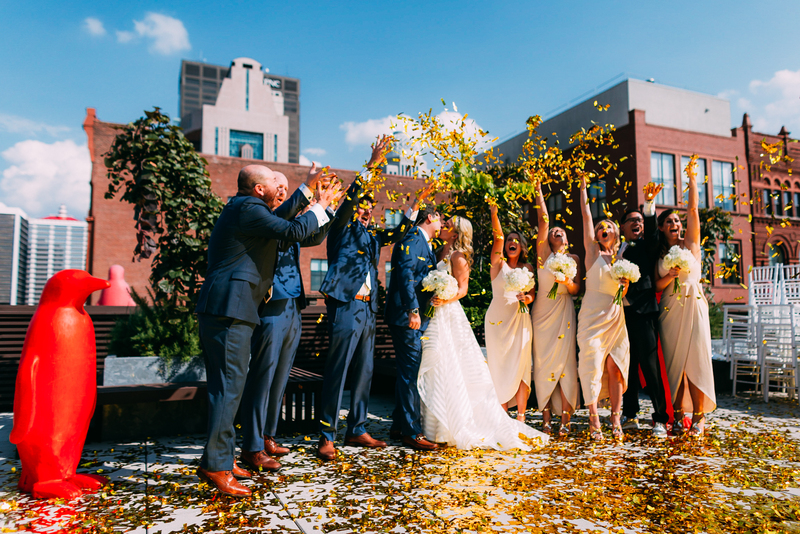 We had the best of both worlds with our ceremony outside on the penthouse terrace and our reception in the main gallery. The Pop Stars! exhibition couldn’t have been more perfect for our reception. 21c: What was your favorite dish from the reception? KB: Definitely the pork chop! I wish we would have had some of the late night food, it was amazing at the tasting! We were too busy on the dance floor, but our guests said it was delicious. 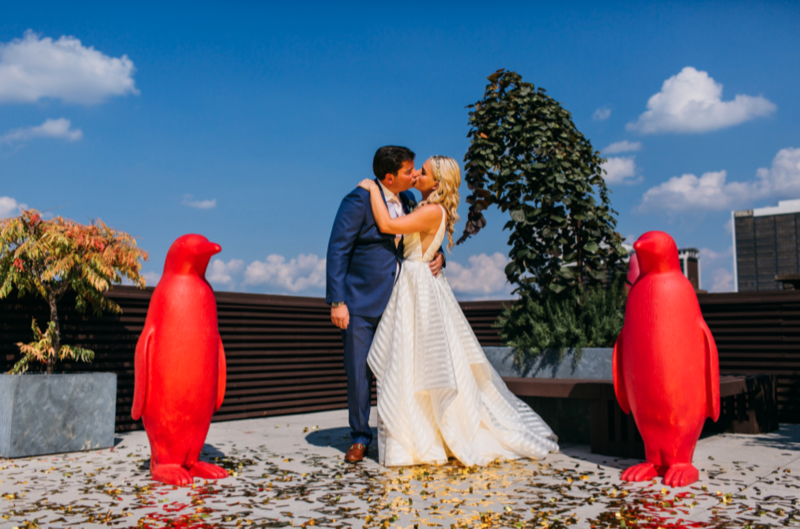 21c: How many penguins are in your wedding album? KB: Probably over 100! When I was a kid I used to think penguin was a bad word, so to have penguins play a big role in our wedding was hilarious! We plan to visit all the 21c locations and collect all the ceramic penguins— we just spent our first anniversary at 21c Nashville. 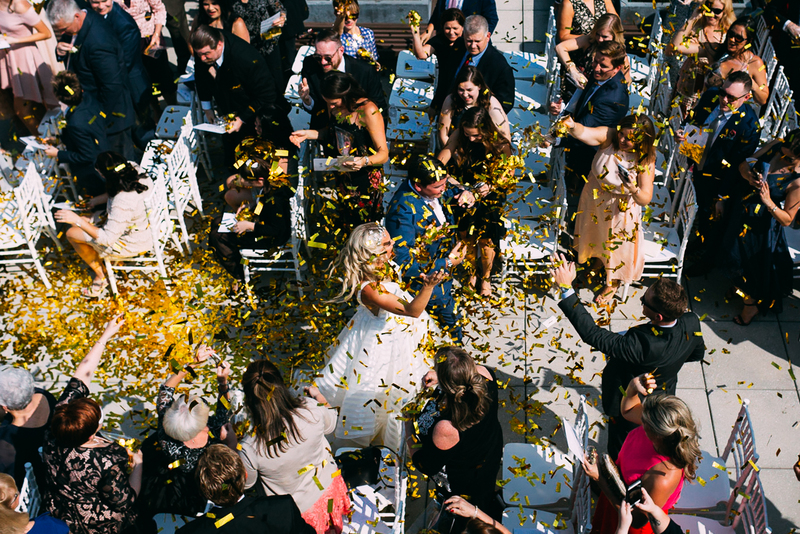 21c: How did your wedding reflect who you are as a couple? KB: Our wedding was wild. I wanted it to be as extra as possible– I had three outfit changes! We were both so happy to have had a bourbon tasting during cocktail hour. Mike loves bourbon and I’m from Kentucky, so it was a perfect fit. The art reflected the overall theme of our wedding. All of our stationery had stars on it, so Pop Stars! could not have been a better fit! 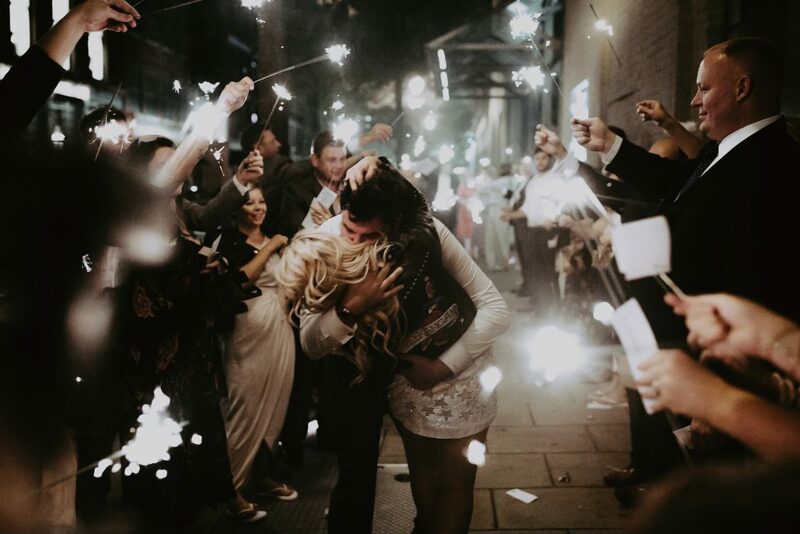 We really wanted to throw the best party for our guests and to never leave the dance floor. We had an incredible band, Naked Karate Girls. They are crazy! They dress up in costumes and toss wild props into the crowd. We had bride, bridesmaid, and bridesman karaoke and they played music to get everyone on their feet all night. I had my Pop Princess moment and sang Britney Spears’ “I’m Not a Girl, Not Yet a Woman” to Mike before I tossed the bouquet. We crushed the wedding game! 21c: What did your guests love most about Louisville? KB: They absolutely loved Louisville! Our wedding was a destination wedding; only 25 of our guest were actually from Louisville. We had guest all the way from Alaska to Amsterdam. Everyone loved the location of 21c, it was super easy for guests to see lots of sites and eat amazing food. We had our welcome party at Garage Bar, so everyone could experience Nulu as well. I couldn’t have asked for a better way to show off the food in Louisville too. Everyone is begging for a 5-year anniversary party in Louisville! Can you hold September 16, 2022? KB: We both have such fun and outgoing friends and family, so I think it might be a tie. The groomsmen loved being in the room with a view David. There are a ton of pictures of them posing with him while they were getting ready. I’m just so happy we had the best wedding photographer, Jaime Smialek, and videographer, Sampley Brothers who captured it all. 21c: What song got the most people on the dance floor? KB: Everyone was on the dance floor all night long, so EVERY SONG! 21c: If you channel some magic penguin-godmother magic and relive your favorite moment from your wedding day, what would it be? KB: Our first dance. Everything was moving so fast that it was the first moment I had to breathe and realize we just got married. I cried a little during our first dance in the beginning. Then we did our signature dance moves, which still makes me laugh. Photos courtesy of the bride & Our Ampersand Photography. 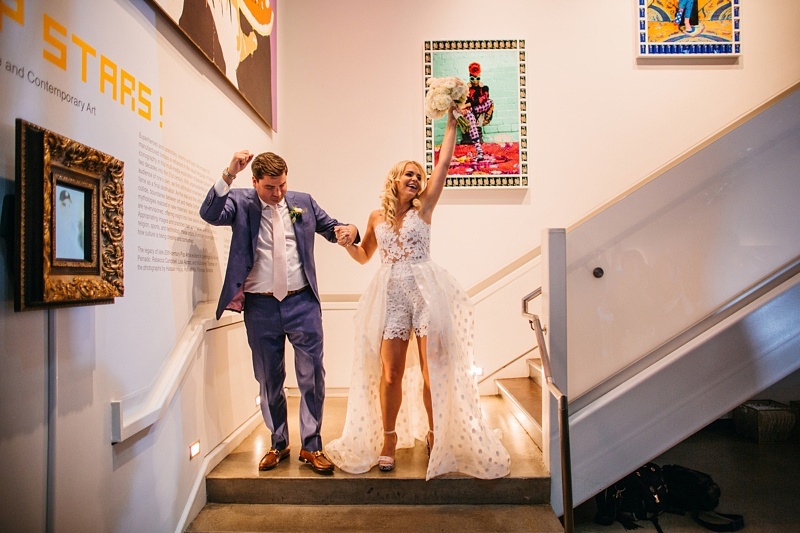 Want to learn more about hosting your wedding at 21c? Explore 21c Weddings.